Asking gamers whether they like to play with other people actually gets pretty complicated. Are we talking co-op or competitive? Do you mean local or online? With friends or with strangers? So in a recent survey, we decided to break all this down. Do You Remember GoldenEye 007? As someone who grew up in the 90s, this is a topic that is near to my heart. There were few things that I looked forward to more than working together with a friend to complete a tough level, or pounding them into dust to show off my skill. Starting as early as Super Mario World or Sonic the Hedgehog 2, and through GoldenEye 007, Super Smash Bros., and Halo C.E., I’ve always loved the experience of sharing my hobby (and a couch) with a friend. I’ve always loved the experience of sharing my hobby (and a couch) with a friend. To this day it’s one of my favorite ways to game, and I’ll be leveling up my Monk in Diablo 3 with my brother later this afternoon. For people like me, it’s been disappointing to see the lack of “Couch Co-op” titles over the years. Many have written on the topic, and there are even websites fully devoted to identifying and tracking co-op titles. One possible reason for this decline is that developers don’t see a market for the genre, and accordingly their efforts have shifted. Here at Quantic Foundry, in addition to the Gamer Motivation Profile, we also have additional research surveys that gamers can participate in. These surveys tackle a variety of game preference questions, and allow us to link gamers’ responses back to things like their motivation scores, gender, and age. 1,266 gamers participated in this research survey. 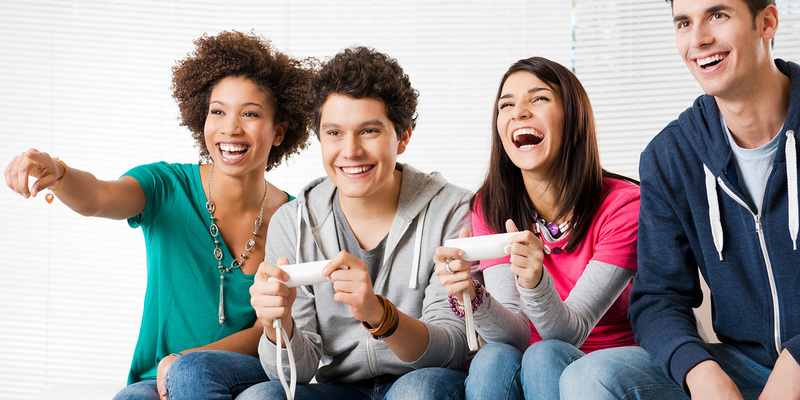 In the survey, we asked gamers to rate their enjoyment of different forms of social gameplay. For the analysis below, we coded these responses numerically, with “Not At All” as 1 up through “A Great Deal” as 5. We’re going to start simple and then drill down. First, let’s take a look at the game modes with friends. 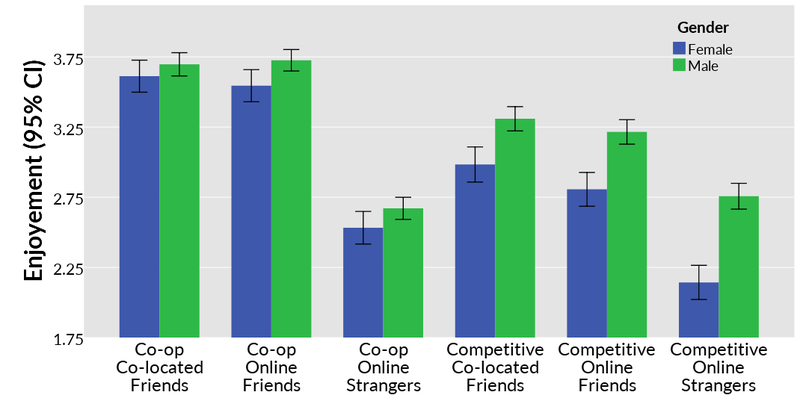 Co-op play, whether in the same room or online, was rated as more enjoyable than competitive play. Let’s break that chart down by gender. 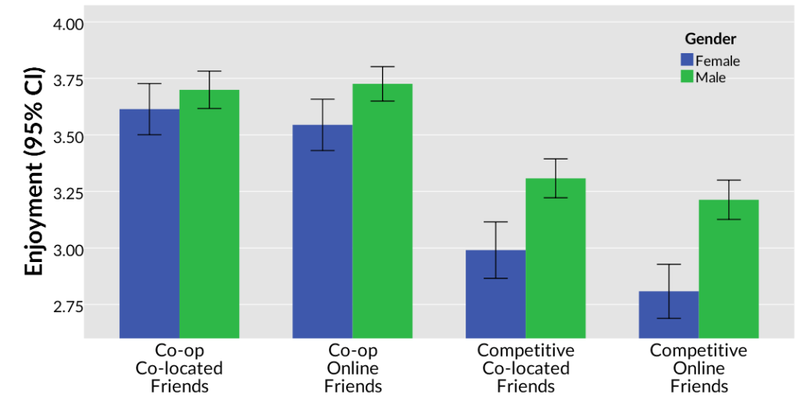 Among the co-op modes, the gender difference is either non-significant (in the case of co-located) or very small (in the case of online). Among the competitive modes though, men rated the gameplay as being more enjoyable. This may provide some insight into the meteoric rise of titles such as League of Legends, DOTA 2, Counter-Strike: Global Offensive, Overwatch etc. These titles may be capitalizing on the best of both worlds, bringing people together to compete, while still being part of a team. So far our analyses have been limited to playing with friends, either in the same room or online. However, especially with the rise of online gaming, playing with people you don’t know has become more prevalent. So let’s throw strangers into the mix. Our results show that this is actually the least attractive option for gamers, for both cooperative and competitive play. 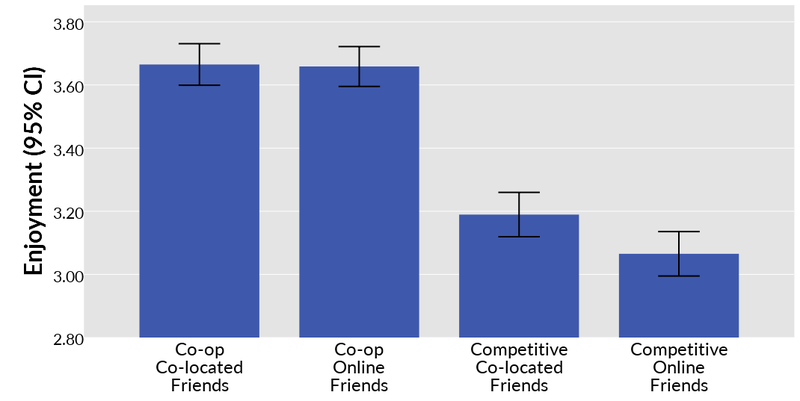 The appeal of co-op gaming drops by roughly one point in the 5-point enjoyment scale when it is with strangers. And this brings it below the appeal of the competitive modes with friends. This drop makes sense considering the higher level of coordination usually required (and the potential frustration of being stuck with a bad pick-up group). We saw earlier that women enjoy competitive gameplay less than men. What the graph above highlights is that this gender effect is magnified when women play with people they do not know. For many gamers, this will not be surprising. It’s not a secret that some online gaming communities, especially competitive ones, can be hostile towards female gamers, even (or especially) when they are highly competent players. This is obviously a complex issue, but it stands to reason that women would be less likely to seek out competitive interactions with strangers, especially with online communities that may have garnered (legitimately or not) such a reputation. The gender effect is magnified when women play with people they do not know. This also complicates what it means to say “women prefer less competitive games”. The data suggests that the interaction with strangers has a much larger impact on women’s enjoyment of competitive play than the actual gender difference itself. Finally, we explored how the appeal of these game modes varied across gamers of different ages. In a previous blog post, we saw that the desire for competition declines rapidly with age and this is consistent with what we see in this current data set. The appeal of all 3 competitive modes drops quite a bit with age compared to the appeal of the co-op modes. In addition to being rated highly, it turns out that co-op co-located play is the only game mode whose appeal is stable with age. All the other modes had a statistically significant, negative correlation with age. When we consider everything that we have looked at so far, some pretty interesting results shake out. Not only is local co-op the most appealing game mode, it is also the most consistently attractive to both men and women, and the only game mode we tracked where the appeal did not decline with age. This hints at another reason for why hunting for Pokemon together in Pokemon GO can have such broad appeal. Instead of being limited to a couch at home, Pokemon GO makes the entire world a space for co-located play. Pokemon GO makes the entire world a space for co-located play. The gamer generation is growing up. With the average age of the gamers being 35 and increasing each year, and knowing that the enjoyment of competitive gaming declines with age, the stable appeal of local co-op points to a growing opportunity. And who knows, poker night could very well be replaced with the next Gauntlet Legends. See how you compare with other gamers. Take a 5-minute survey and get your Gamer Motivation Profile. Kaleb Embaugh is an analytics intern at Quantic Foundry. As a lifelong gamer with a background in industrial/organizational psychology, he writes about how the two intersect. Hey Jerbo, good catch! All fixed now. Glad to hear our stuff will be helpful with what you’re working on. Nice piece. How is co-op defined? Group of players working together vs AI e.g. normal mode in Left For Dead, Don’t Starve, OR does it mean a team working together in a competitive environment, e.g. Overwatch, MOBAs, Day-z? Hi Marta. In the survey, we listed the modes as “co-op gameplay” and “competitive gameplay” without any additional descriptions. So in this sense, we were asking about the experience of “teaming up” independent of whether competition is present. Breaking co-op down explicitly for both AI / humans would definitely be interesting for a future survey. This is a really fantastic survey. We at AirConsole care a lot about local multiplayer / co-op games and we have built a whole universe around these types of games (both cooperative and competitive). With over 40 titles published and a growing community, I must say that local co-op games are true social games that unite all genders and ages. Perfect post! Your blog is a gem for Games UX researchers, I can’t wait for that next survey to see if co-op against an AI or co-op against another team of people differ. I also wonder if there are links with the broader game genre, for example coop party games are very different from let’s say RPG coop and I wonder how those evolve with the age of the gamer. thus I only use internet for that purpose, and obtain the latest information.